The process by which science is worked out – peer review – is not perfect but it is reliable. What gives science integrity is that it has to hold up both to scrutiny from fellow experts before it is ever published, and to the real world once people begin to use it. It is not possible that one part of science – climate – has been corrupted and functions outside this scientific process. An individual scientist, on the other hand, might say things that are at odds with the rest of the scientific community. Physicist Fred Singer clearly knows loads about science. However, in addition to testifying before the US Congress that carbon dioxide (CO2) emissions were not a primary cause of global warming, he has also testified that cigarette smoking does not cause cancer. You could probably find a scientist who says that we should pray instead of giving children antibiotics; you just won’t find any scientific organisations that will agree. To emphasize the point, Jim Powell, a science author who served 12 years on the US National Science Board, appointed by Presidents Reagan and George H.W. Bush, reviewed 13,950 peer-reviewed climate articles published between 1991 and 2012. Of the 33,690 authors of those papers, the 24 rejecting articles were written by 34 authors. 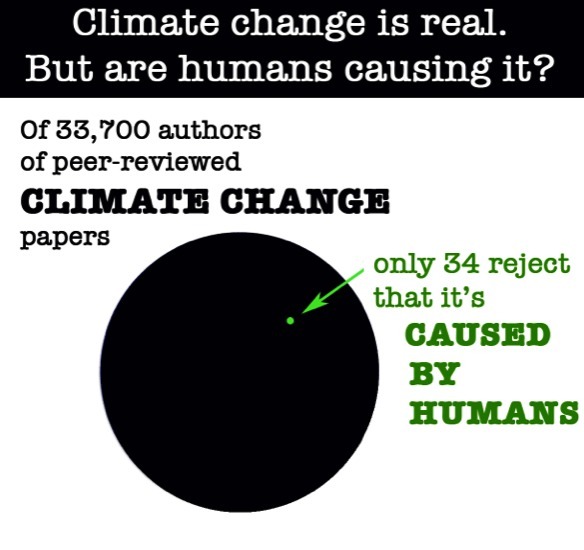 In other words, only about 1 of every 1000 climate scientists published over 21 years would reject that climate is changing, and/or that humans caused it. 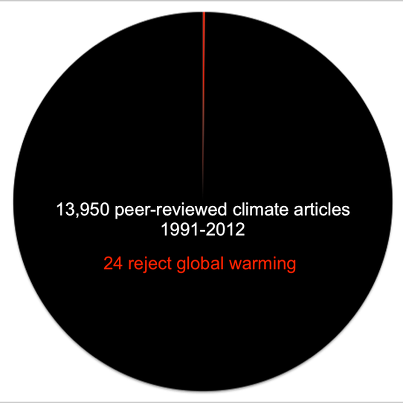 Figures: Left: In the review of peer-reviewed climate articles published between 1991-2012 on the Web of Science by James Powell, only 24 reject global warming. Right: the 24 papers were penned by only 34 total authors out of 33,700 for all articles reviewed. Peer-reviewed publications that support Powell’s claim can be found, here and here. So someone says climate scientists are in it for the money, the opposite is true: if a climate scientist could actually prove that climate change wasn’t happening or man-made, they’d be rich, and have their career made. This page adapted from the Citizens’ Climate Lobby US Laser Talk.